The Recent page shows only API proxies and target services that have had traffic over the last hour. 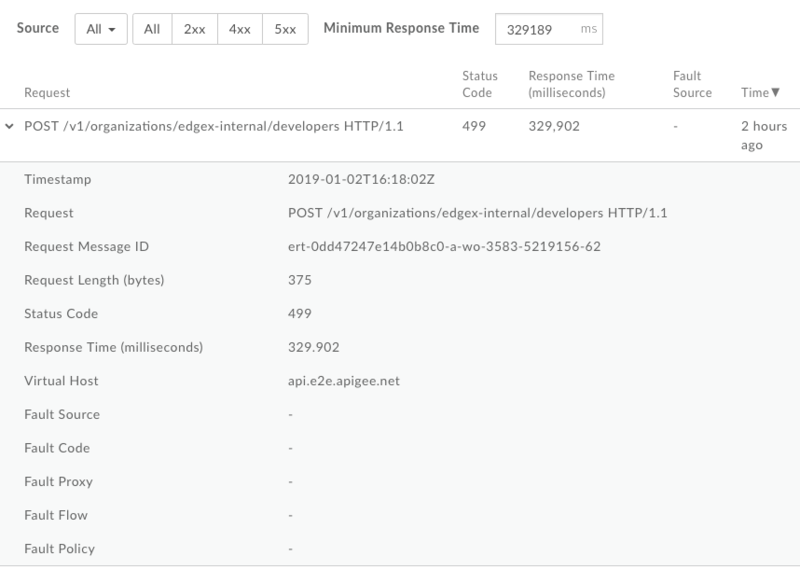 The List view displays summary information for the API proxies and target services in your organization that have had traffic in the recent past. To display the List view, click Recent on the API Monitoring dashboard. The List view is displayed by default. Navigate back to the List view at anytime by clicking in the Recent dashboard. Click the name of an API proxy or target service in the list to view detailed data in the right pane. Create a custom report and add additional dimensions. Click . View the current context in the Timeline or Investigate dashboard. Click > View in Timeline or View in Investigate, respectively. 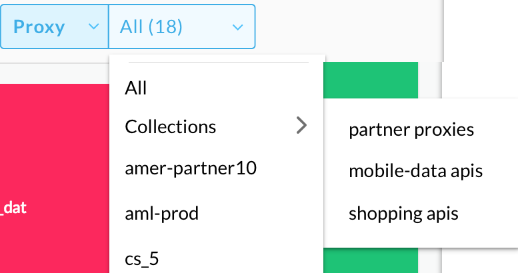 Search the List view by name or URL (such as, https://acme.com/api). Enter all or part of a relevant string in the search box. You can search for content in the Proxy, Targets, or Region fields. Note: If the Alerts only filter is selected, only the API proxies or target services that have alerts will be listed in the search results. Show and hide target service details in the list. When viewing the List view, a red warning icon and red left border line indicate which API proxies and target services have alerts. Notes: See Set up alerts and notifications for information about setting up alerts. 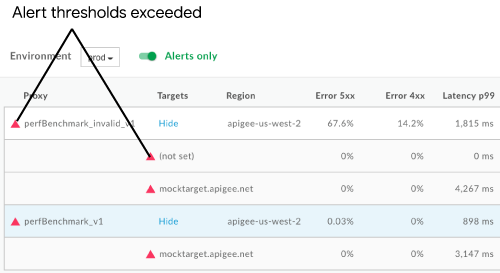 Click Alerts only to display only the API proxies or service targets that have alerts. To view an at-a-glance summary of the number of 4xx and 5xx errors, and the overall error rate, hover your mouse pointer over any of the numeric values in the table. To view detailed data for an API proxy or target service, click its name in the List view. The detailed data displays in the right-hand pane. Create an alert and add additional alert conditions, set up notifications, and generate a custom report based on the alert. Click > Create Alert. Total Traffic Total number of transactions. Total Errors Total number of errors. Total Error Rate Percentage of traffic that resulted in errors (Total Errors/Total Traffic). Note: API Monitoring compares this percentage to the alert conditions that you set. If the total error rate exceeds the thresholds, alert indicators are displayed in the UI. Average TPS Average transactions per second. Total Latency (P99) Total response latency value in the 99th percentile calculated over a 5-minute rolling window. Note: Shown for API proxies only. Target Latency (P99) Target response latency value in the 99th percentile calculated over a 5-minute rolling window. Error Source Breakdown and total percentage of API proxy bundle errors (4xx and 5xx) that occurred. Note: Latency graphs are displayed for API proxies only. The median, P95, and P99 latency values are calculated over 5, 15, and 60 minute intervals, respectively. Each value is updated in the graph at 1, 3, and 10 minute intervals, respectively. For example, the P95 latency value is updated in the graph every 3 minutes using data captured over the last 15 minutes. 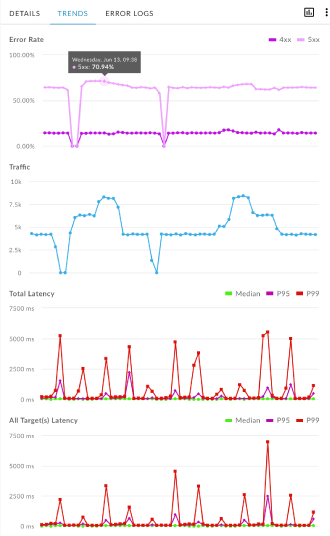 Hover over different points on the graph to display at-a-glance error percentages, total traffic counts, and latencies, respectively, at each point. 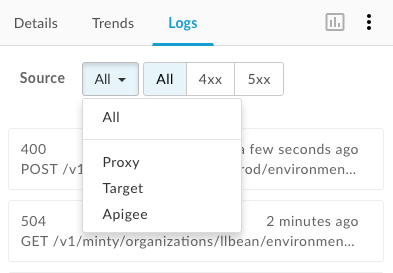 In the Logs tab, filter by 4xx, 5xx, or All errors, and narrow the source of errors by the API proxy, target service (your service), or Apigee (Apigee infrastructure). Click an error to open the logs dialog and expand its details in the list. The Heat Map provides a color block view that enables you to identify which environments have alerts. Green indicates that alert condition thresholds have not been exceeded. Red indicates alert condition thresholds have been exceeded and alerts have been triggered. Click on the Recent page to display the Heat Map, shown in the following figure. Click a block in the heat map to view detailed data in the right pane. Set the heat map display scale by setting scaled by to logarithmic or linear. 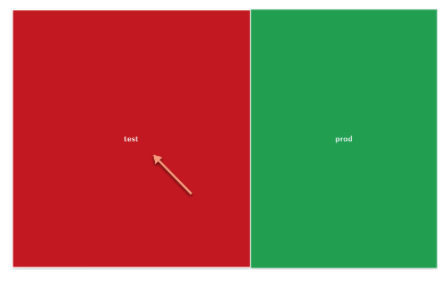 Linear sizes the boxes according to overall traffic ratios. For example, a proxy with 200 calls is twice the size of a proxy with 100 calls. Search the Heat Map by entering all or part of a relevant string in the search box. You can search content in the region, environment, proxy, or target maps, depending on what is currently displayed. 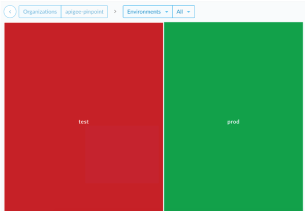 When viewing the Heat Map, a red block indicates which environments, API proxies, and target services have alerts. For more information about setting up alerts, see Setting up alerts and notifications. test environment is red because its traffic error percentages have exceeded the alert condition threshold you set for the specified timeline. prod environment is green because its traffic errors percentages have not exceeded the alert condition threshold for the specified timeline. Filter the display by selecting components from the drop-down lists. 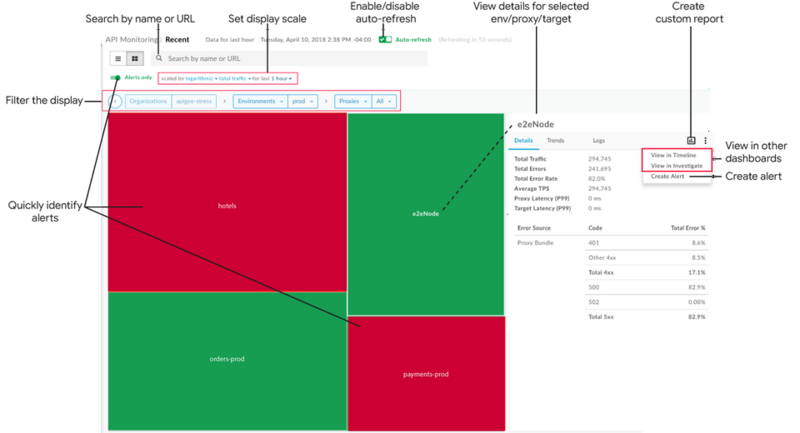 Or double-click a box to drill down from the environment map to an API proxy map, and from an API proxy map to the service targets map for that API proxy to identify the API proxies and target services that have alerts. Click Alerts only to display only the environments, API proxies, or service targets that have alerts, depending on what is currently displayed. To navigate back up a level, click . To view detailed data for an environment, API proxy, or target service, click the corresponding box in the Heat Map. The detailed data displays in the right-hand pane. Clicking a box in the map also displays at-a-glance the number of calls and the error rate over the last hour. Click Recent in the API Monitoring dashboard. Select an API proxy or target service in the List View or Heat Map filter drop-downs to view more details. Note: Custom reports are not available if the Proxies and Targets filters are set to All. The custom report page displays in a new tab with relevant fields pre-populated and default dimensions and metrics. By default, the custom report is named as follows: API Monitoring Recent Generated Note: If a custom report already exists for the current context, it is opened.